Here is my Rubbermaid 32 gallon brute system. ...to the grow bed, a seven gallon storage bin, which is about 7 inches deep. A ball valve in the outlet allows me to control the flow rate. System is still cycling as of today, but it just goes to demonstrate that even with a tiny space (less than 4 square feet of floor space) you can still have the pleasure of this at home. If it's worth doing, it's worth doing right! 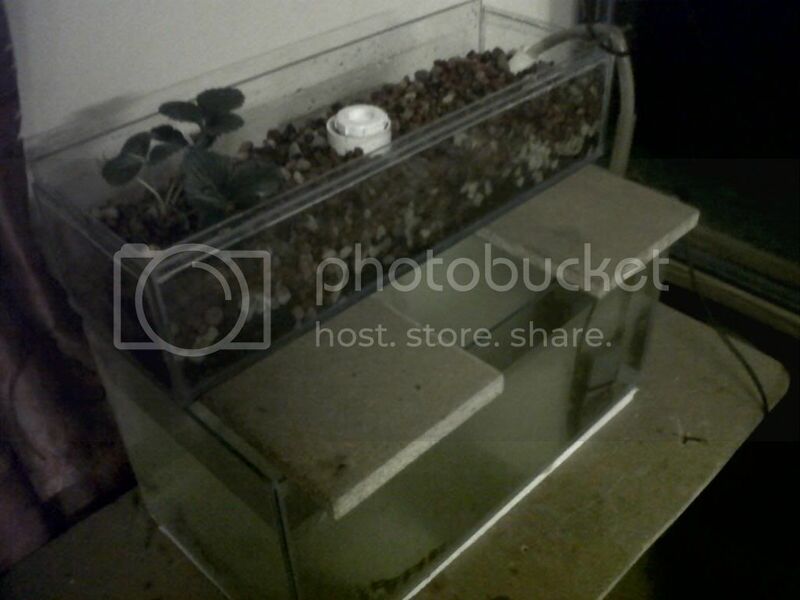 300lt Tank 13 cubic foot Grow bed. Not yet fully cycled. Love that bamboo cladding! Did you buy it or make it yourself? First system located in the basement. 50 Gallon FT, 30 Gallon Sump, 20 Gallon Flood Tank and two grow beds from blue barrels. Water overflows via venturi drain into sump, pump from sump goes to flood tank, flood tank floods grow beds and returns via gravity to fish tank. Waiting on hydroton order to begin fish less cycle stage. Tanks's 3' x 18" x 18", grow bed's half a blue barrel. There's a bit of foam insulation between the ply and the glass to help keep the temps under control in such a small system. Am only going to put in goldfish for there temperature tolerance and the tanks to small for eating fish anyway. Plus the small child loves thecoloured fishies. File comment: planted at the start of winter well see how it goes. I bought a 6' x 8' section of bamboo fence from Lowes and cut it apart to make the various pieces. Ended up being a lot more work than I thought it would be. Had I realized it I wouldn't have done it. But I'm happy with the results. So this is my system I have built over the last week or so. I know it is not very pretty or anything, but it is my budget beginning. My neighbor thinks I should add a few more spokes to the system, since the pump pushes a pretty heavy flow. I was thinking of maybe putting a concrete post in the ground and doing a sort of teired pvc system.. idk not there yet. I would love comments. something to conisder with the old guttering - was it connected with any lead flashing? also the fish may eventually die from zinc toxicity. After redesigning the first system and redoing it several time in the past month but here we are! The fish tank is a 75gallon rubbermaid look a like. The gb is 2 pallets with 2x12's attached to the top with a pond liner. Have had bass in the tank for for a little over 2 weeks. Some died but still have a few cruising around in there. It has an 800 gallon per hour pump. The grow bed is close as I could get to 4'X8' and 12" deep. also have 2 3 foot 4"dia. pvc pipes for hanging gb's, for strawberries. I'll post more pics in the next few days as we progress to getting water to the grow beds. Its taking forever!!!! I'm pretty sure the next one and hopefully there is a next one will go a lot faster!. Thank you all who have answered my many questions while I've been lurking the past few months. Here's the pic of the FT and the worlds best helper! File comment: Worlds best helper!! I am very happy to be a member of this site. I have a small system. The weather is hot and dry. 2% of the water is changed every day And 15 liters per day is evaporated.A total of 20 liters of water a day is added to the system.Calcium carbonate, potassium carbonate, magnesium sulfate, although the days are added to the system.The chelated iron is added every three weeks.very small amounts of Manganese sulfate and zinc sulfate are added each month. it has a 70 gallon fishtank with a 30 gallon grow bed. highly productive. I stocked the fish too densely and I've been taking water out of it and using it to water my garden to keep the nitrate down. Anyone in the Omaha Metro want some white nile tilapia around 5 inches long? This is my first small scale test system in my living room. 50 gallon fish tank and 30 gallon grow bed. The plan is to add a 100 gallon fish tank turning the 50 gallon into a sump, and another 30 gallon grow bed. This will stay inside and come feb or so I'm going to build a green house and larger outdoor system. SYstem is just about 2 months old at this point. Since these pictures were taken, the basil was replaced with more swiss chard, a trellis net was put up and 2 burpless cucumbers plants added. 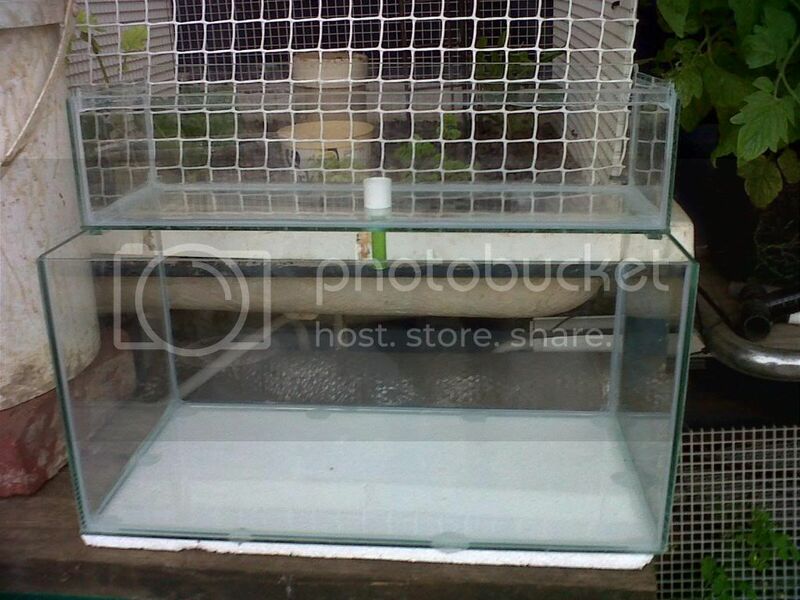 fish tank: 55 gallon food drum with SLOW to overflow into 2, 30 gallon flood and drain grow beds. They empty into a 50 gallon sump. 3rd bed is a DWC bed. it is fed from the pump in the sump tank. Window is south facing and gets plenty of light, but im supplementing with 2 94 watt T5 HO fixtures. My 40L setup that I use for my germination and to grow seedlings to about 15cm to plant out. Runs flood and drain with a 150 l/h aqua-via pump and aerated with 150 l/h aqua-via internal filter pump with air suction venturi.